Positive Detroit: Its Official: Prince Fielder Signs 9-Year Deal with Tigers (fun video included)! Its Official: Prince Fielder Signs 9-Year Deal with Tigers (fun video included)! The Detroit Tigers stunned the baseball world Tuesday by reaching agreement with Prince Fielder on a nine-year, $214 million contract, the fourth-largest deal in baseball history. The deal was first reported by Yahoo Sports. The Tigers, who learned last week that they would be without designated hitter Victor Martinez for the 2012 season because of a torn knee ligament, replaced him in lavish fashion by luring one of the game's top sluggers to Detroit. It's unknown whether Fielder will play first base or DH since All-Star Miguel Cabrera is entrenched at first. They could share time at both positions, but Cabrera is a former third baseman. The deal was orchestrated quickly, and likely with owner Mike Illitch heavily involved. General Manager Dave Dombrowski said last week on a conference call that they wouldn't be involved in the bidding for Fielder. Earlier Tuesday, the Texas Rangers, one of Fielder's top suitors, indicated they were out of the bidding for the three-time All-Star. Fielder follows in the footsteps of his father, Cecil, who played seven years for the Tigers in 1990-1996 and hit 51 home runs for them in 1990. Prince even hit an upper-deck homer at the old Tigers Stadium as a 12-year-old hanging out with his dad. 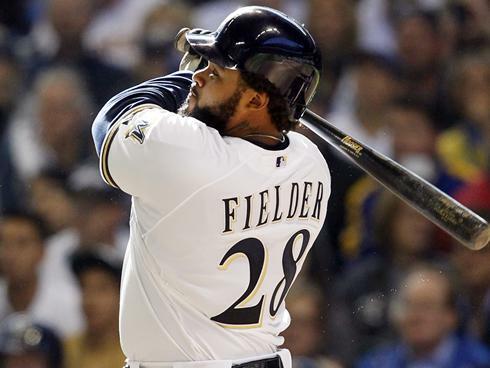 Fielder, who was also being courted by the Washington Nationals and Texas Rangers, has averaged 37 homers and 106 RBI the last six years with the Milwaukee Brewers. For the past few seasons, Fielder and Ryan Braun created perhaps the game's most daunting left-right combo in the middle of an order. Now, he has exchanged Braun for Cabrera, who has averaged 35 homers, 115 RBI and a .974 OPS in four seasons with the Tigers. What's more, the Tigers will pay more than $44 million through 2015 for both Fielder and Cabrera. Barring a trade, they will add Martinez to the mix in 2013, and Cabrera may be forced to move back to third base or, perhaps, the outfield.